Blog Prompt – What is a best friend? Now and when you were in school. I had wonderful friends in school since I came back to the states in the 3rd grade.Â After we graduated and our lives separated, we recently were reunited on Facebook.Â I love it now that we can keep in touch. Kathy and KimÂ have been my best friends for years now and I hate that we don’t live in the same area anymore. I’ve been gone now for 7 years now and even though we chat online during the week and speak on the phone now and again, my heart hasn’t been the same. I had a really hard time when Kathy told me she had a pap smear came back bad and that she was going to have to have a complete hysterectomy. They were also going to look for other problems once they got in there, but luckily all tests came back clear and she is fine. It was very hard for me to be here and she was there not knowing if she had cancer or not. Very Hard!! Kim received wonderful news about her son passing is law boards and I hate that I had to hear via email.Â I know we all would’ve went out to celebrate he is finally threw with school and all his accomplishments. 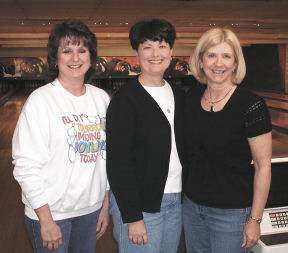 I do get to see them maybe once a year when I go back to Missouri for a visit now and again.Â The picture above was taken at our favorite place, the bowling alley, the last time I was up there for a visit. I wish we could get together more often. We always have a great time together and they sure do make me laugh. I loved eating lunch with Kathy during the week, griping about who knows, enjoying a drink on Friday night after work and she was my favorite bowing partner. She was the sister I never had. We will always be friends for life. Even if it is long distance. I’m so glad that you have such good friends. Even though you don’t get to see them in person as much as you like, at least you stay connected.